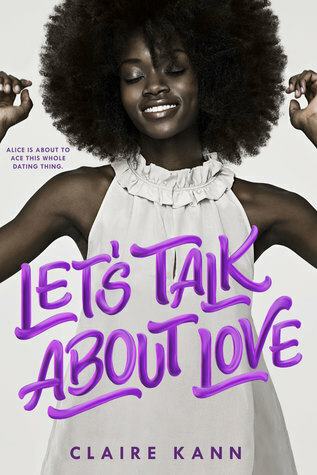 I absolutely love the cover of LET’S TALK ABOUT LOVE, and I’m delighted that Alice is black, biromantic, and asexual. Can you tell us more about Alice and what’s going on in her life at the start of the novel? Alice is probably the most overdramatic character I’ve ever written, and I love her. She loves Netflix, eating, and living the sloth life; is funny, joyful, and caring; possesses an unfiltered and raw honesty when it comes to all of her feelings–good, bad, and the murky middle. She doesn’t hold back. At all. LTAL takes place during Alice’s tumultuous summer between freshman and sophomore year of college as she redefines what different kinds of love mean to her–platonic, familial, and romantic–and the ways they are present in her life. She’s experiencing severe growing pains with her best friends, dealing with the fallout of a terrible breakup and the start of a new relationship she isn’t sure she’s ready for, and arguing with her parents about law school because while she doesn’t know what she wants to do, it’s certainly not that. From the excerpts I’ve read, Alice has a very distinct (and fun!) voice. What was it like to craft her character? In a word: hellish. Because of Alice’s aforementioned honesty, I knew every aspect of who she was before I began writing. Personalities like hers are fun to read, but not to write for me. Ultimately, when she was the narrator, the scenes became chaotic, and large chunks of the text had to get cut. I don’t like to waste words or my time, so I had to switch the narrative to third person. At the same time, I didn’t want to override her voice with my own. It took quite a bit of time to figure out the best way to tell this story, and I ended up settling on and abusing parenthetical asides. Has she changed much between when she first popped up in your head and the final version of the book? Nope. Alice is the same. The only thing I did do was purposefully omit a lot of her reactions. For example, she cried a lot more on the page in initial drafts. Through several rounds of edits and bouts of writer doubt, Alice remained the only constant I could hold on to. I loved the description of Takumi as a “knight with a shiny library-employee badge.” Tell us more about him and why he catches Alice’s eye. Very few of the YA books I’ve read have the characters already in college. Why did you choose to set the story then instead of high school? I believe there is a difference between Teen and Young Adult books. At nineteen and in college, Alice is still a young adult figuring things out. There’s this pervasive idea that once someone turns eighteen, they’re adults and expected to act as such, including having their career path figured out. They should have spent the past four years of high school preparing for college and selected a college major that would put them on the right track to said career. I really wanted to write a story with a main character who didn’t know any of that. Alice followed her friends to college because it was the easy choice, and a year later at nineteen, still had no idea what kind of career path she wanted. Why is it important to you to write about marginalized characters falling in love and having cute romances? Because it’s real! It happens! Readers deserve a chance to see it, let it touch their hearts, and give them hope. YA has systemic problem of not allowing those relationships to exist on the page. Five years ago, a book like LTAL would have had a tremendously hard time getting published, if it even got out of the query trenches. I know because I queried different books and have the detailed rejections to prove it. But YA books like To All the Boys I’ve Loved Before, When Dimple Met Rishi, Everything Everything, and Simon Vs. prove that readers are not only hungry for these kind of stories, but are also willing to support them. A cute romance can be the plot now for us. It’s finally enough. Right now, I’m working on my next book with my publisher, Swoon Reads. I also consider myself an online storyteller and regularly post new stories to Wattpad (@ClaireKann). There, you can find stories about everything from a teenage vampire falling in love with his fat girlfriend who can also use magic to college kids with severe god complexes. Lots of fun to be had by all. What 2018 books by or about people of color or people from First/Native Nations are you looking forward to reading? Which ones would you recommend to our followers? Is there anything else you’d like to tell us about LET’S TALK ABOUT LOVE? I think both the book and I would like to say thank you. Writing LTAL was a labor of hope, frustration, and fear. It means so much to me that readers can connect with Alice and her story the way they have. The support its received so far has genuinely been a transformative experience for me. I’m so happy this little book about love is allowed to exist in the world. Claire Kann hails from the glorious Bay Area where the weather is regrettably not nearly as temperate as it used to be. She has a BA in English/Creative Writing from Sonoma State University, works for a nonprofit that you may have heard of where she daydreams like she’s paid to do it. A sucker for instant gratification, she posts new stories regularly to Wattpad, including her novels THE SCAVENGER HUNT, which won the 2016 Watty Award:HQ Love, and #FAT GIRL MAGIC, which won the 2017 Watty Award: Riveting Reads and ranked #1 in the Paranormal category. LET’S TALK ABOUT LOVE is her debut novel, publishing in 2018 with Swoon Reads/Macmillan.